Blogmas Day One: Step into Christmas! Finally, the last of the Autumn leaves have fallen, December is upon us and I can unleash the full force of my Christmas excitement - though, if I'm honest, I haven't exactly been supressing it! Christmas excitement, for me always begins in the October half term, which I know might be a little too soon for some people, but in my house, the half term isn't complete without a Christmas movie day! Throughout November my barely containable excitement hasn't stopped growing! Aided of course by a Christmas Spotify playlist, Costa's seasonal drinks, festive jumpers and the increasingly cold weather! I've almost finished my Christmas shopping so I'm hoping for a stress free, fun filled December. After successfully completing blogmas last December, I was definitely up for the challenge again! So, welcome to blogmas 2015! Blogmas Day Twenty Four: OOTD: Winter Walks! Blogmas Day Twenty Three: OOTD: Christmas Party! Blogmas Day 16: Festive Nails! Blogmas Day Thirteen: A Week In Words! Blogmas Day Eleven: My Christmas Traditions! 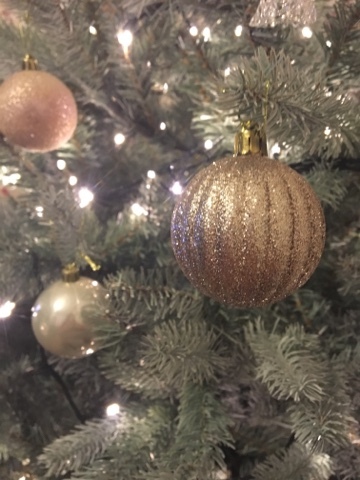 Blogmas Day Ten: My Christmas Tree! Blogmas Day Eight: Festive Accessories! Blogmas Day Four: Eat, Drink and Be Merry!